Tom Riding reflects on the introduction of the first Foden 4x2 tractor units to enter service with W & J Riding in 1994. 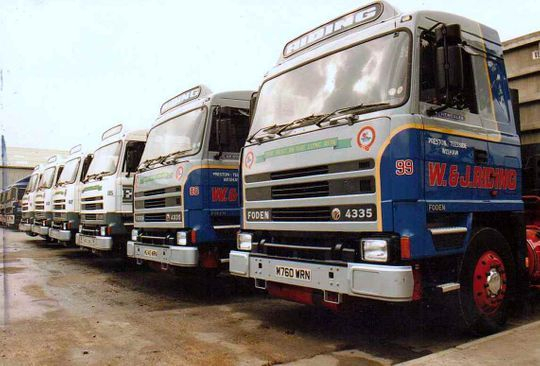 "As always we were trying to get a low unladen weight, and the EC series ERF tractor unit had steadily got heavier. At the time we were pulling 30 foot tipping skeletal trailers combined with rotary discharge feeders and as always weight was critical. In 1994 we decided to purchase a batch of ten sleeper cabbed Foden 4X2 4335 tractor units powered by Perkins 335TX engine's which joined the fleet at the rate of three in September 1994 then around one per month between January and June 1995 with five going to our Teesside depot and five based at Longridge. Initially each of the ten tractor units cost £39,750 plus vat direct from Fodens on top of that there was the additional cost of hydraulic tipping and pumping equipment along with the cost of the Gardner-Denver compressor which amounted to a final on the road total of around £46,000 each, which was quite an investment for our company at that time. 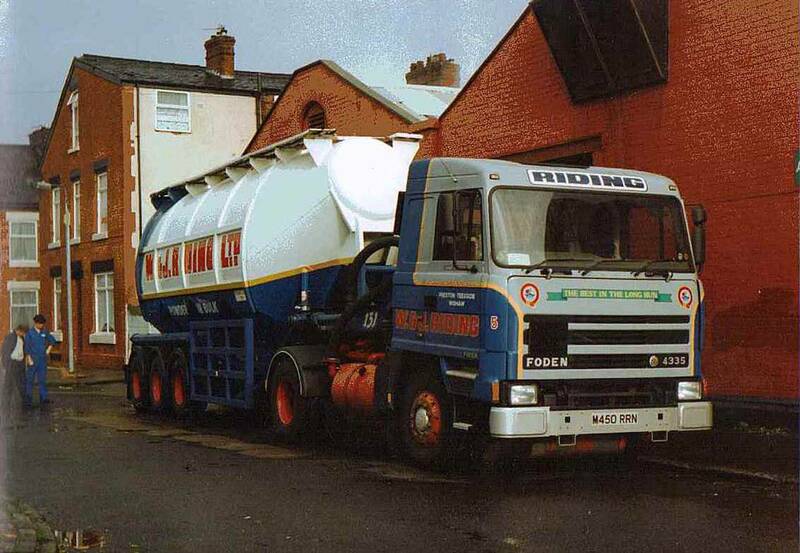 After serving their time in the fleet all of our Foden tractor unit's were eventually sold on to Miles Fox of Clitheroe". The very first Foden 4x2 tractor unit to be introduced into the fleet was Reg No M450 RRN Fleet No 5 'Great Eastern'. 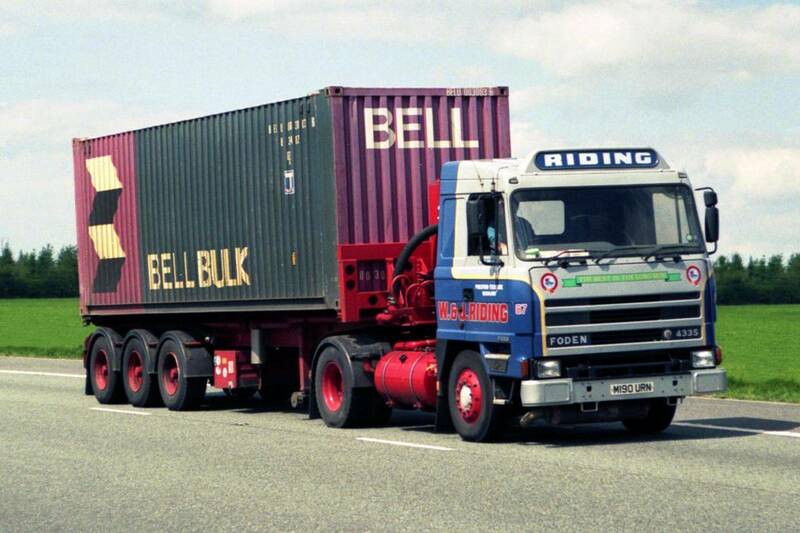 Powered by a Perkins 335TX engine it was registered new by Riding's on the 24th of September 1994. 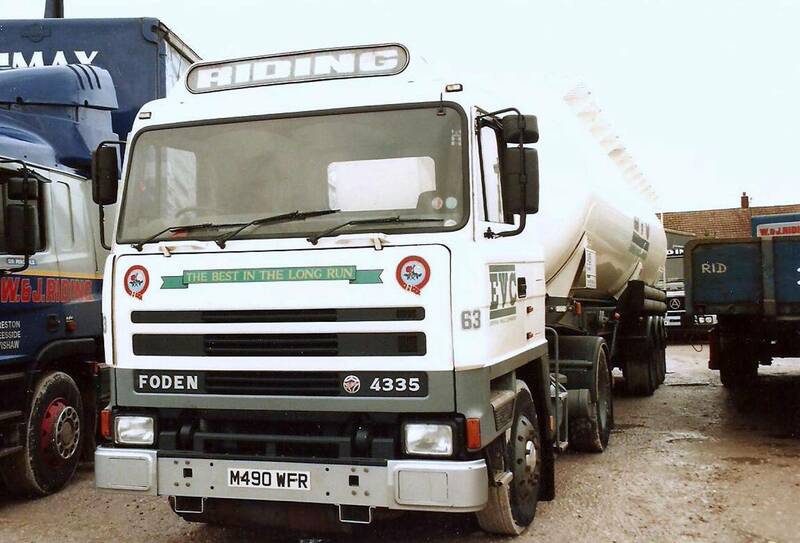 One of a batch of ten Fodens introduced into the fleet in 1994/5, M450 RRN was based at Riding's Teesside depot and was driven from new by Vernon Goodision, but on this particular occasion it was being driven Ian Bulmer. It is seen here coupled to a non tipping Crane Fruehauf tanker while discharging sugar at Duerrs jam factory on Prestage Street in Old Trafford Manchester. An on the road shot of Foden 4x2 tractor unit Reg No M450 RRN Fleet No 5 'Great Eastern' pictured heading South on the A1M near Scotch Corner. Powered by a Perkins 335TX engine this was the first of a batch of ten Foden 4x2 tractor unit's introduced into the fleet in 1994/5. 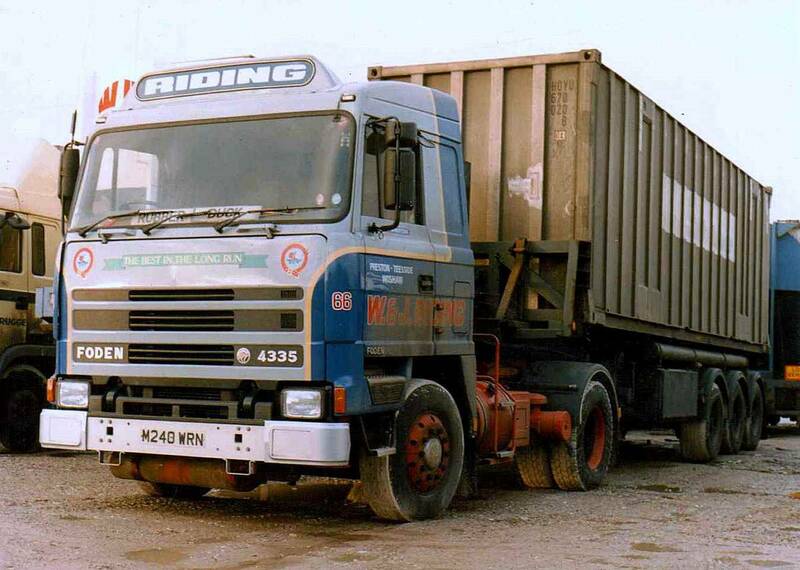 M450 RRN was based at Riding's Teesside depot and was driven from new by Vernon Goodision. 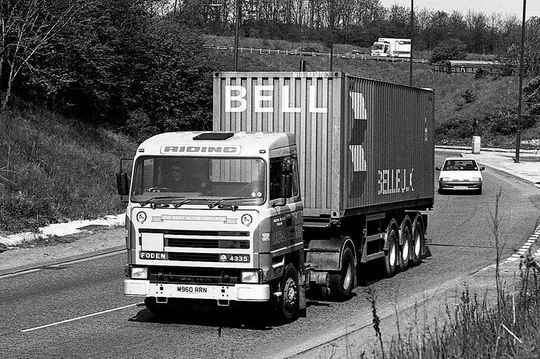 Seen here negotiating the roundabout at Junction 33 of the M62 and the old A1 junction at Ferrybridge in West Yorkshire it is hauling a 33 foot tri-axle skelly trailer with a standard 30 foot Bell container on board. 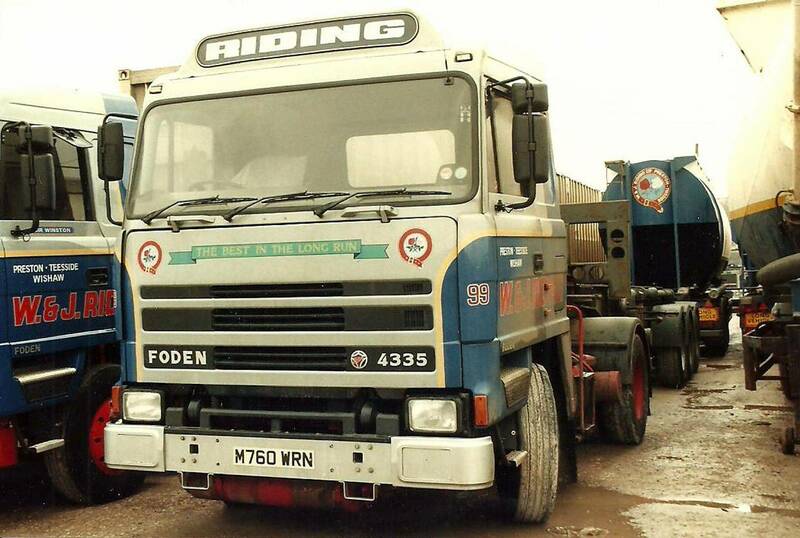 The third of the batch of ten Fodens to enter service with the company was Reg No M870 RRN Fleet No12 'Great Central'. Registered new on the 24th September 1995 this was also a Teesside based tractor unit and was driven from new by Jean Claude Newman. 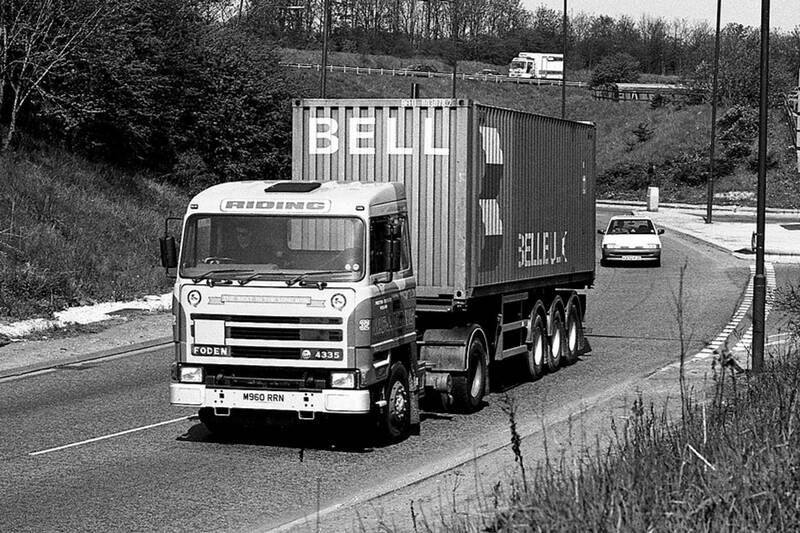 Seen here on the A1M in North Yorkshire it is hauling a 33 foot tri-axle skelly trailer being used to deliver a 30 foot Bell Line container containing bag in a box bulk plastic material. 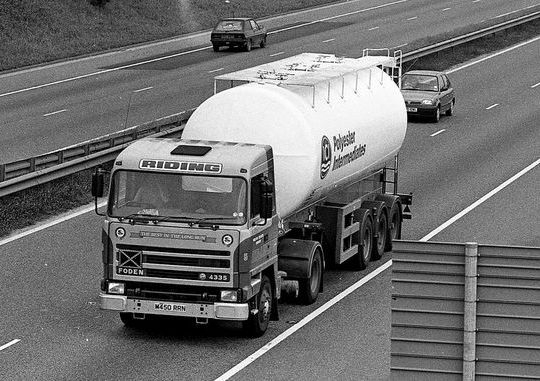 Powered by a Perkins 335 TX engine, as were all the Foden's in the fleet, it is seen here heading South on the AIM in North Yorkshire while hauling a 55 cubic metre Crane Fruehauf tipping tank used exclusively on the European Vinyl's Corporation (EVC Ltd) contract. Ted had 45 years service with the company and was the first bulker driver at Riding's when they started the tanker business back in 1968. Coupled to a 55 cubic metre Crane Fruehauf non tipping tanker, in European Vinyls Corporation Ltd contract livery, it is seen here arriving back at Longridge depot on the 23rd of December 1995. 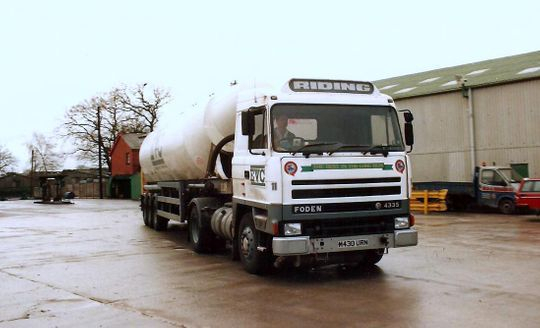 Foden 4x2 tractor unit Reg No M190 URN Fleet No 87 'Lode star' was registered new on the 10th of February 1995. This tractor unit was based at Riding's Teesside depot and was driven from new by Mike Rich. It is seen here pulling a 30 foot tipping skelly trailer fitted with a rotary feeder at the rear of the trailer for discharging pellets and powders using the bag in a box system. 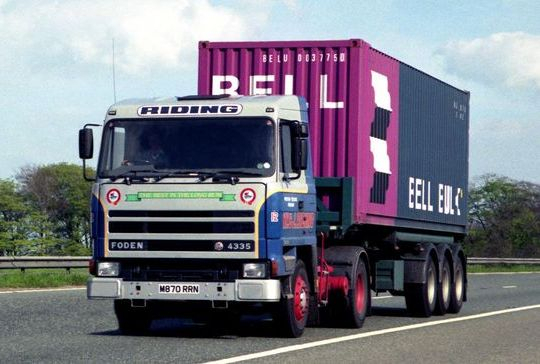 The container belongs to Bell Line for whom Riding's delivered loads for all over the country. 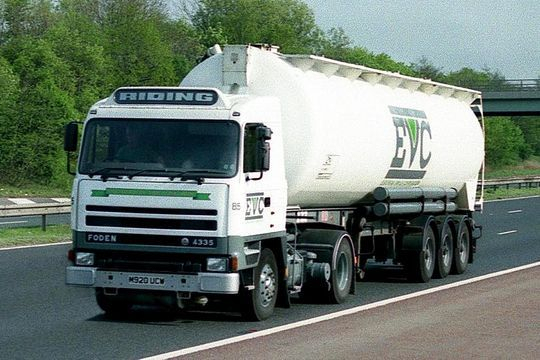 In the contract livery of European Vinyls Corporation (EVC Ltd) it is coupled to a 55 cubic metre Crane Fruehauf tipping tanker also in EVC Ltd contract livery. One of a pair of Foden's Riding's registered new on the 1st of April 1995 it is seen here heading South on the A1M in North Yorkshire pulling a 2000 cubic foot Carmichael tanker, used exclusively on the European Vinyl's Corporation (EVC Ltd) contract. 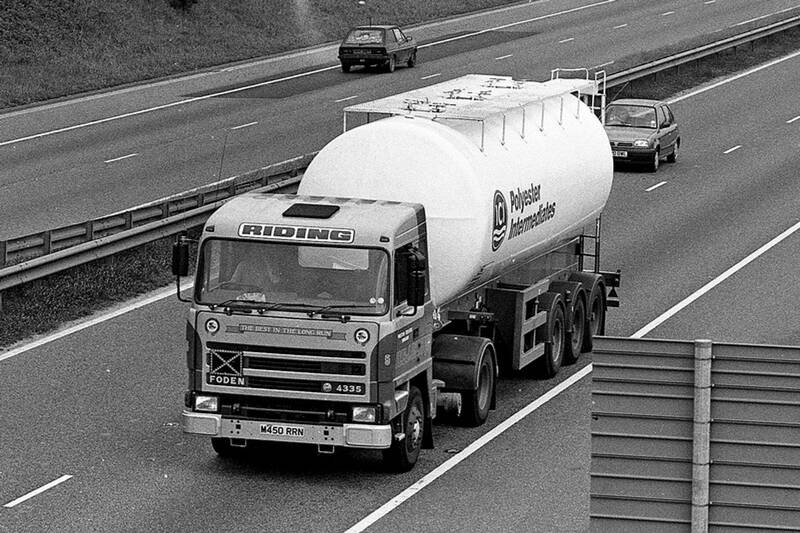 These tankers were used for delivering PVC in bulk nationwide both from Runcorn in Cheshire and Barry in South Wales. Foden 4335 4x2 tractor unit Reg No M240 WRN Fleet No 66 'Sir Winston' was registered new to W & J Riding on the 1st of May 1995 and was based at Longridge depot. Assigned to the general haulage fleet It is seen here in a filthy condition prior to going on the wash bay at Longridge while coupled up to a tri-axle 30 foot tipping skeletal trailer belonging to Verbrugge. Another shot of Longridge based Foden 4335 4x2 tractor unit Reg No M240 WRN Fleet No 66 'Sir Winston'. Registered new on the 1st of May 1995 it is pictured here on the Eastbound side of the M62 Hartshead Moor service area in West Yorkshire. Foden 4335 4x2 tractor unit Reg No M760 WRN Fleet No 99 'Hercules', registered new on the 1st of June 1995, was the last of the batch of ten Foden 4x2 tractor units to enter service with the fleet in 1995. Based at Longridge depot, and powered by a Perkins 335TX engine, as were all ten of the Fodens in the fleet, it is seen here coupled up to a tri-axle 30 foot tipping skeletal trailer belonging to Verbrugge. Another shot of Foden 4335 4x2 tractor unit Reg No M760 WRN Fleet No 99 'Hercules' sees it parked in the depot at Longridge while coupled up to an empty 30 foot tipping skeletal trailer belonging to Verbrugge. 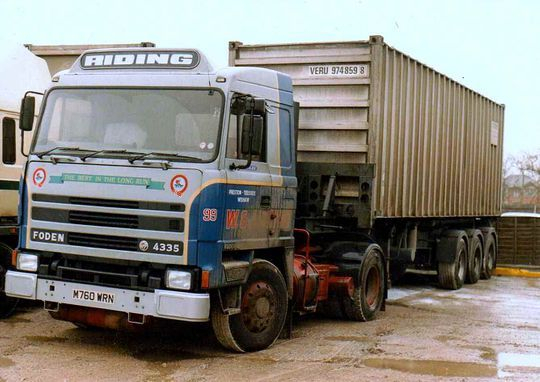 Registered new on the 1st of June 1995 M760 WRN was the last of the batch of ten brand new Foden 4x2 tractor units to enter service with the fleet in 1995. A line up of six Foden 4335 4x2 tractor unit's parked up for the weekend at Longridge depot with Foden 4335 4x2 tractor unit Reg No M760 WRN Fleet No 99 'Hercules' in the foreground. 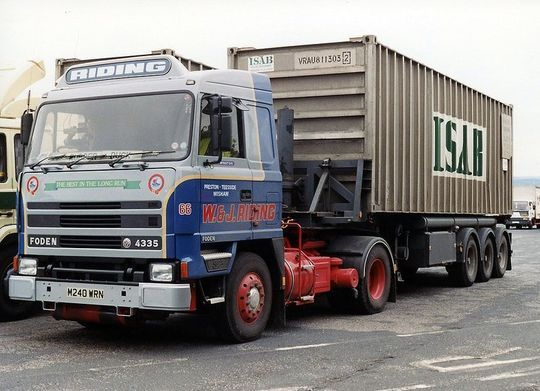 "These Fodens were chosen for their lower unladen weight and over the years they certainly gave a very good account of themselves although there were not as popular with the drivers as the EC ERF's we had in our fleet. After serving their time at Riding's all ten of our Foden tractor unit's were eventually sold on to Miles Fox of Clitheroe".